I can’t believe that exactly 6 years ago today Super Cute Sweets was born! It all started out of my love for sweets. I wanted to have the ability to share my ideas with everyone! So much has changed since 2011! At the time my boyfriend and I had been dating for almost two years. In August of 2012 we got engaged and in December of 2013 we got married. Then in February 2016 our daughter Mila was born! It has been a ton of work and a bit exhausting at times but more than anything it has been so much fun! 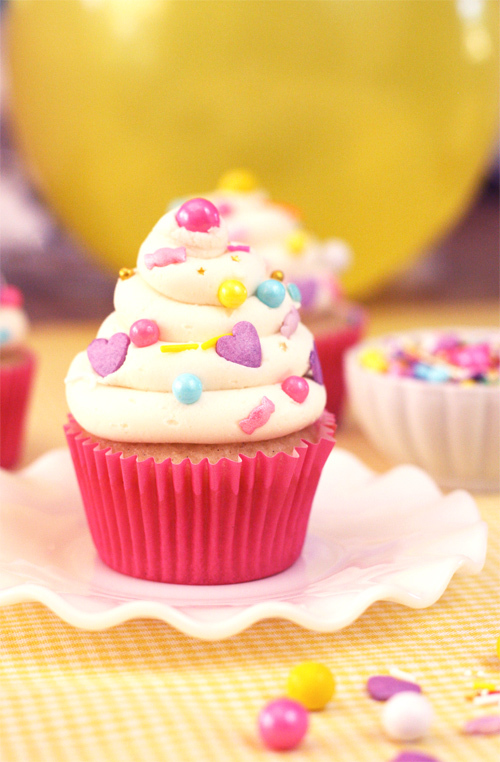 For Super Cute Sweets’ 6th birthday I wanted to share with you my favorite simple, soft & moist vanilla cupcake recipe. I love vanilla! I love chocolate too but vanilla has a special place in my heart. This recipe is so easy! 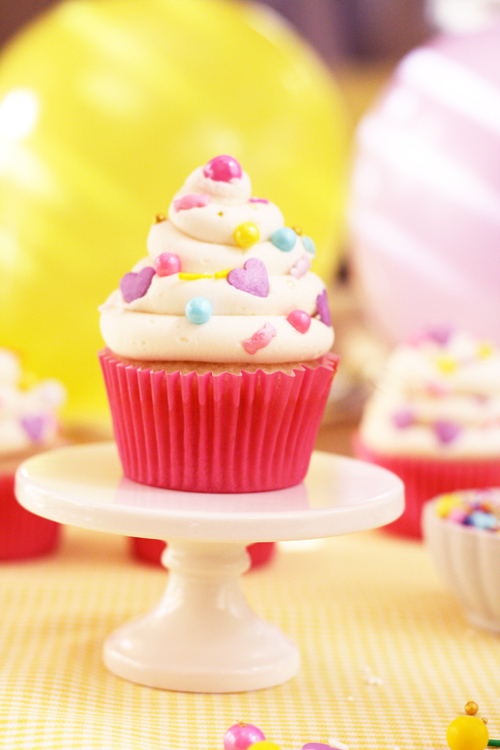 And the end result is a batch of delicious soft & moist cupcakes that melt in your mouth. 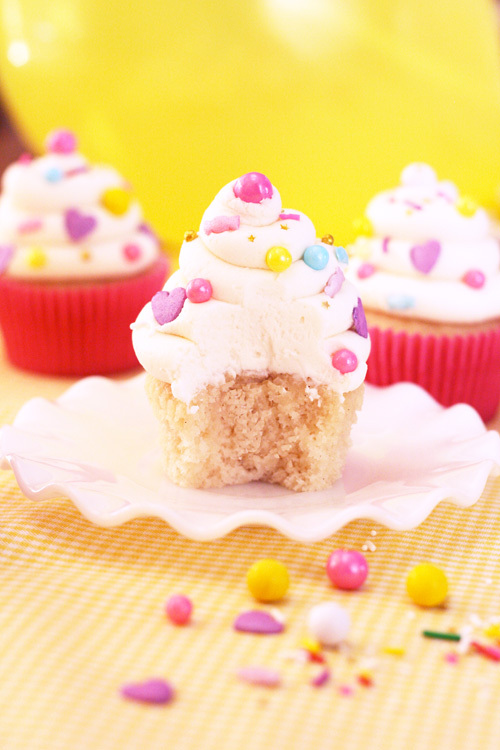 I have paired the vanilla cupcakes with my go to vanilla frosting recipe. They go together like pancakes and syrup or peanut butter and jelly! 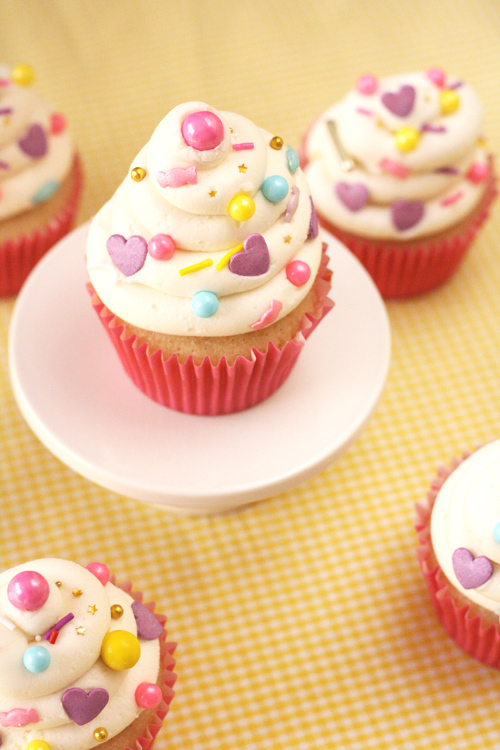 I found the cutest sprinkles that complement the birthday occasion perfectly! The sprinkles are called Party Monster and they add the perfect touch to this special birthday! 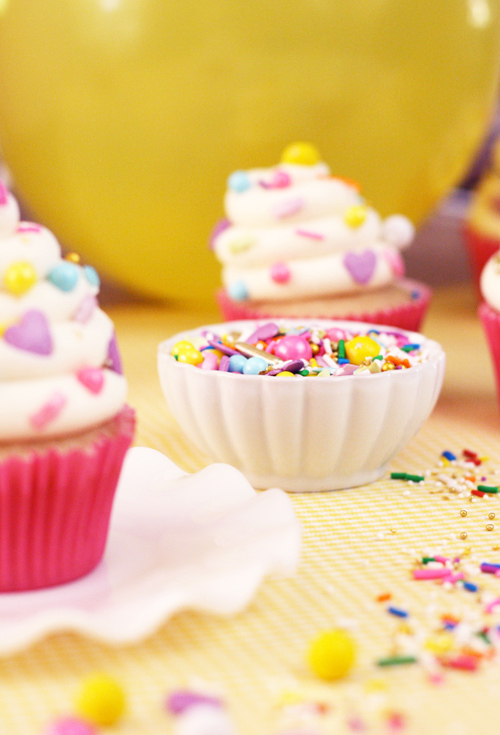 Insert cupcake liners in a cupcake pan. Sieve the all purpose flour, sugar, baking powder and salt into a medium bowl and set it aside. In the bowl of a stand mixer add milk, vegetable oil, vegetable shortening (melted), vanilla extract, vanilla bean paste, water, egg and beat until combined. Scrape the sides of the bowl and mix once again to make sure everything is well incorporated. Let the cupcakes cool for 5 minutes in the pan and then transfer them to a cooling rack. Sieve the powdered sugar into a medium bowl and set aside. In a bowl of a stand mixer cream the butter and high ratio shortening on low speed. Add the vanilla extract and mix on low speed. Add two cups of powdered sugar and mix on low speed until incorporated. Add the last two cups of powdered sugar and mix on low speed. The frosting will look a bit dry. Next add milk, depending on how soft you want the buttercream add more milk. If you want to buttercream to be stiffer add less milk. Pipe the frosting onto the cupcakes, I used an Ateco 806 piping tip. I can’t wait too see where the blog will be in the next 6 years! But for now all I can say is that I can’t wait to share many more recipes and tutorials with you!